Builder: John Brown 8 Co Ltd, Clydebank, Glasgow, Scotland. Dimensions: 1020ft x 119ft. Depth 74ft. Engines: Sixteen steam turbines single-reduction geared. 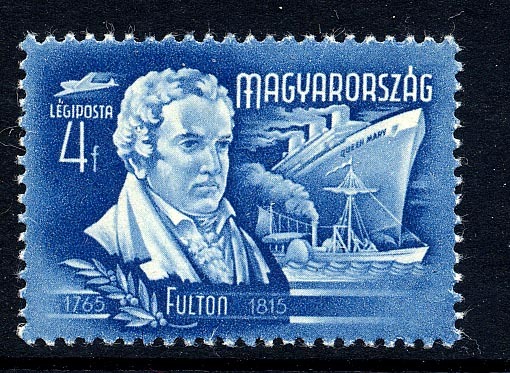 Passenger accommodation: 711 first, 707 cabin and 577 tourist class. 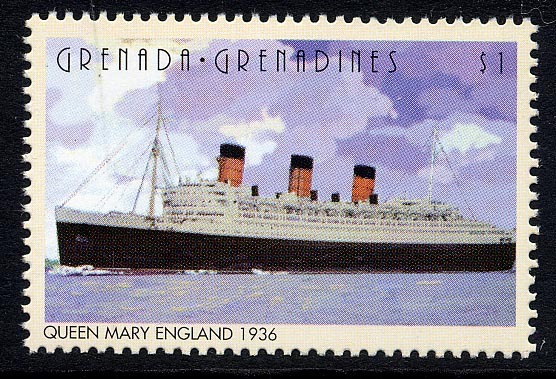 Maiden voyage: Southampton-Cherbourg­-New York on May 27, 1936. 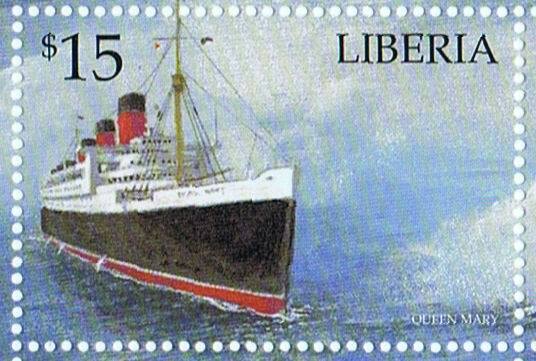 On her sixth voyage out the Queen Mary won the Blue Riband from the French Line's Normandie by making the run from Bishop Rock to Ambrose Lighthouse in 4 days, 27 minutes at a speed of 30.14 knots. 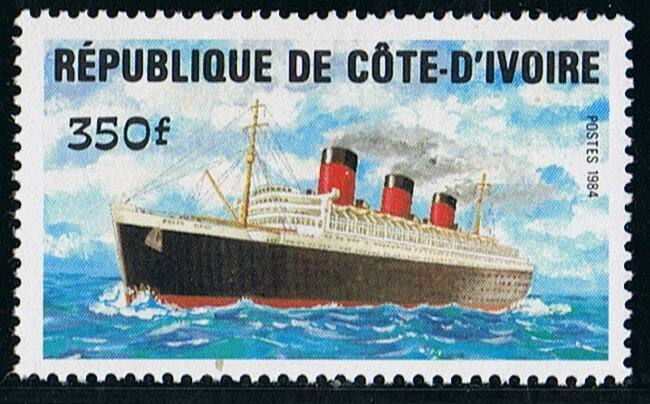 She soon lost the title back to the Normandie the following year, but recovered it in 1938 with an outward crossing of 3 days, 21 hours and 48 minutes at a speed of 30.99 knots. 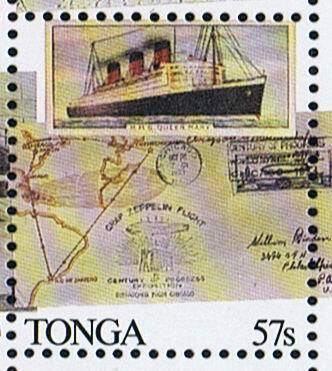 Com­missioned as a transport on March 1, 1940, while at New York after being laid up since the outbreak of war. 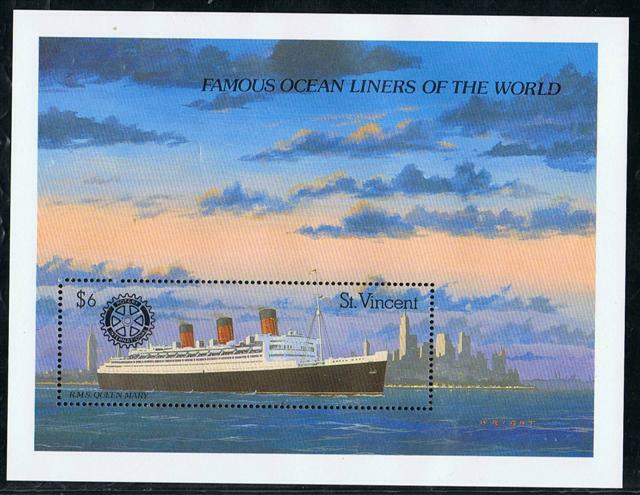 Fitted out at Sydney, Australia, and made her first voyage from there on May 5, 1940. 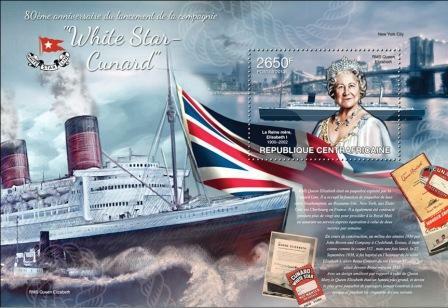 On October 2, 1942, the anti-aircraft cruiser Curacao attempted to clear the bow of the Queen Mary while in convoy, but failed and the Queen severed her stern like a knife cutting through butter and killing 338 of the men on board while just north of Bloody Foreland, Ireland. 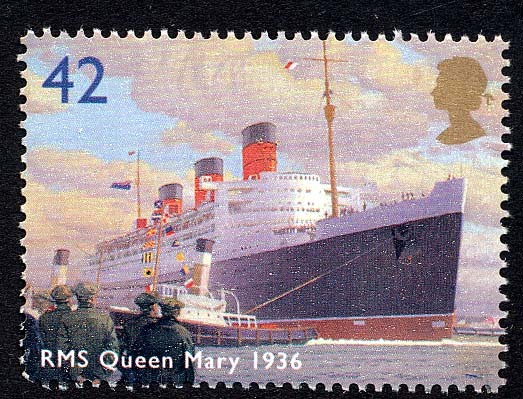 On September 29, 1946, the Queen Mary arrived at Southampton from Halifax on her last trooping voyage and a few days later was sent to John Brown's for reconversion to a passenger ship. 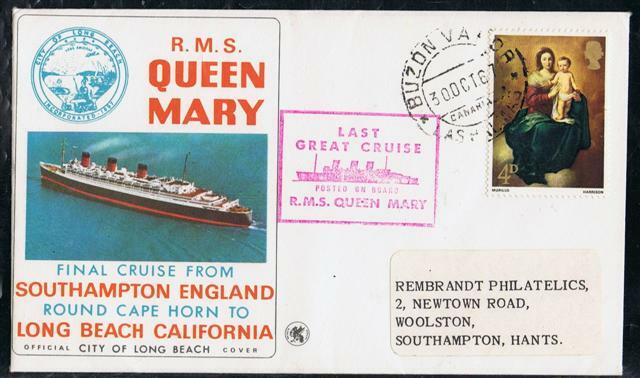 Almost a year later she com­menced her first post-war sailing from Southampton to Cherbourg and New York on July 31, 1947. 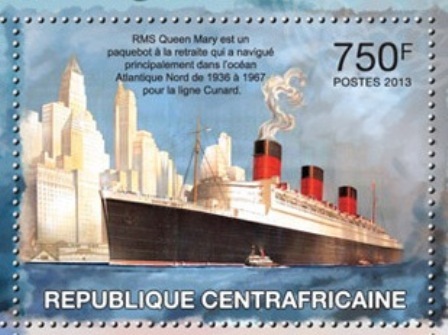 The Queen Mary was engaged in the Southampton —Cherbourg--New York service with a call at Ply­mouth eastbound. Some of the Queen's out­standing features are her promenade deck which is 750ft long ; a rudder weighing some 140 tons and her anchors each of 16 tons with 165 fathoms of chain cable. Her after funnel is 78ft above the boat deck. 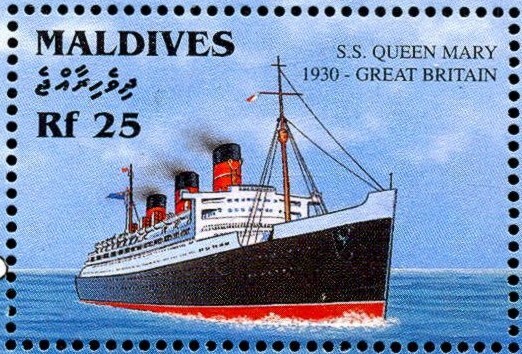 In 1958 she was fitted with motion stabilisers. 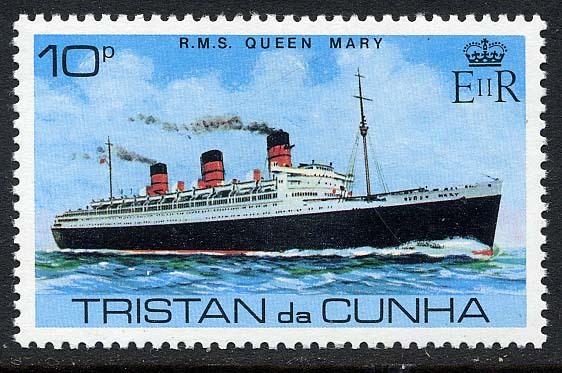 Operating at a loss of about S2 million a year in the latter part of her life, the Cunard Line decided to sell her to the highest bidder in May 1967 rather than send her to the scrapyards. On August 18, 1967, the transaction was enacted with the City of Long Beach, California, for a con­sideration of $3450000. Arriving at Southampton on September 27,1967, completing her thousandth and last voyage for the Cunard Line. 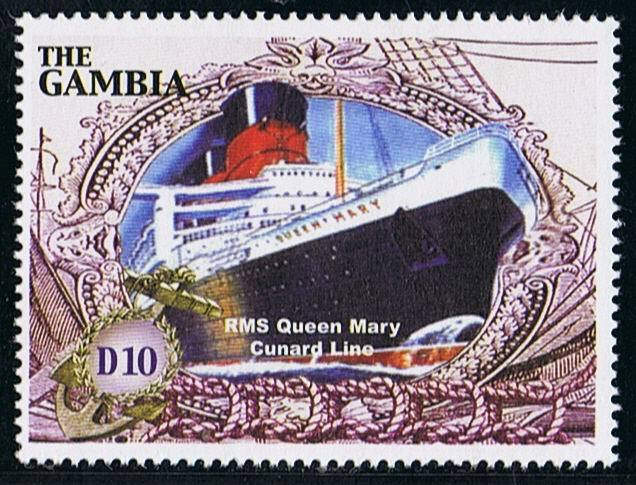 Refitted over a period of four years when she opened for business as a maritime museum and hotel and convention centre on May 10, 1971. 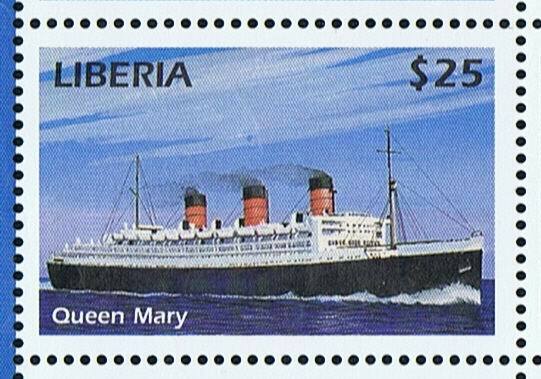 The Queen Mary is now enjoying a long rest after her many years of service. 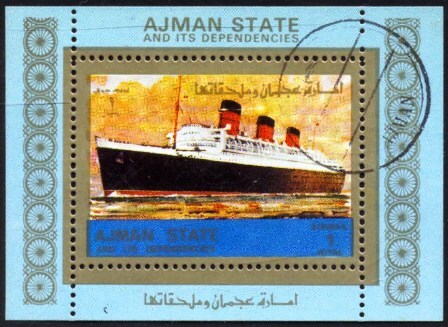 Ajman 1973 1R sg?, scott? 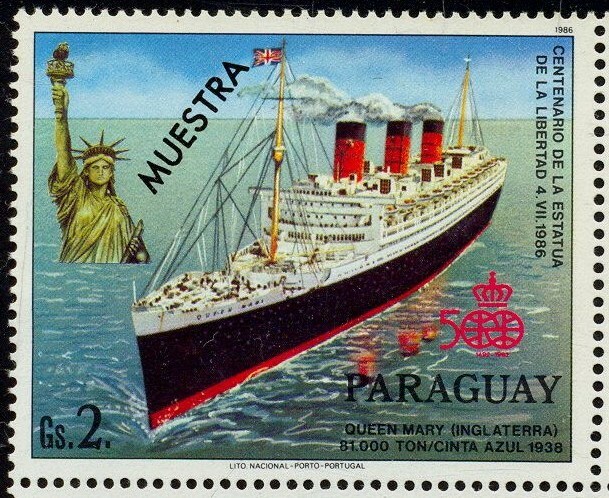 Paraguay, 1986, S.G.?, Scott; 2178d. 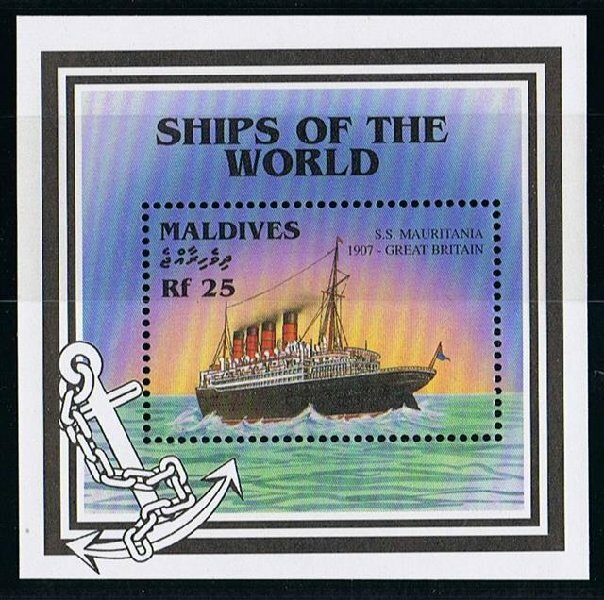 Maldive Islands 1997, S.G.?, Scott: 2230. 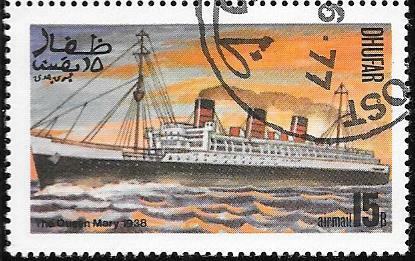 Dhufar 1977 15 b. StG. ?